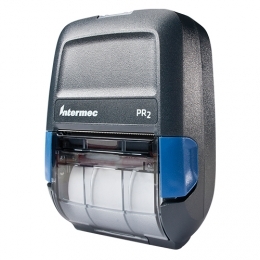 For mobile POS and payment applications you need a receipt printer like the PR2 from Intermec. With its compact size and low weight it is a practical companion for daily mobile operation - both indoors and out. Use narrow 58 mm rolls for the PR2 and your results are sales slips and invoices crispy printed at 203 dpi. At 76 mm per second the receipt is printed in no time. The battery with intelligent battery management is easily replaceable, so that you extend operating times with a separately sold replacement battery. Charge either in the printer or separately. The PR2 is also FlexDock-compatible, which also opens up to you a variety of data communication and charging options. Access by remote control simplifies the centralized maintenance and installation of updates. Connect the mobile printer easily via USB optionally available are also Bluetooth, IrDA and Wi-Fi. Optional accessories, such as a magnetic stripe reader and various support devices make daily use easier, and expand the range of functions.